Paso Robles has been my place to seek a good bottle of wine the last four years, as my sisters and our daughters travel over President’s Holiday. But, this year I was feeling like a new adventure, convincing everyone we needed to explore new territory. I suggested a trip to Temecula, a 75 minute trip from Orange Country. My husband and I explored Temecula over 12 years earlier and felt the wines needed to mature. I thought it was time to see if the wine had grown up, was worth tasting. The decision was unanimous and our plan was set into motion. I went to the Temecula Wine Country website and downloaded their Winery Self-Guided Tour Suggestions, printing the “Rancho California Trail East”, “Rancho California Trail West”, “De Portola Wine Trail”, “Off the Beaten Path”, “Calle Contento Wine Trail”, “Familiar Favorites”, “Something for Everyone” and “ Old World/New World Temecula Style.” We decided to start on Saturday with the Rancho California Trail East since I recognized some familiar names from a past trip such as: Maurice Car’rie Winery, Van Roekel Winery, South Coast Winery Resort & Spa, and Wiens Family Cellars. Meeting up at the Spring Hill Suites Temecula Valley Wine Country right off the 15 freeway leading to Temecula Wine Country, we had our maps ready to go. Heading east on Rancho California Road for about 7 miles we arrived at our first winery, Maurice Car’rie Winery. Much to our chagrin the place was a zoo! It was literally packed to the gills. The parking lot had buses and limos as well as family cars. They had a “Farmer’s Market” type art festival as well in the parking lot. We walked inside and turned around, retreating to our cars. Oh no! What have I done? Temecula is only 50 miles north of San Diego, 75 miles from Orange County and 90 miles southeast of Los Angeles. It felt like all 27 million people from the surrounding counties were all visiting this busy weekend. We visited several more wineries on our list and felt like we were at Disneyland on a ‘Black Out Day’. The tasting rooms were as big as a Costco and felt impersonal. The area around the wine bar was ten deep in tasters. Forget about a paper wine flight list for note taking. They weren’t available and when requested, I received an incredulous look like, “Why are you asking for such a thing? Here just drink your wine!” You had to buy tickets for the wine pourer to check off wine your taste, until your card was finished. The fee for tasting was high, $15–$20 for only five wines. Prices increase on a holiday weekend. We ended up skipping South Coast Winery & Spa, and Ponte Family Estate Winery, all on our list. Determined to have a good experience, I convinced the group to stop at Wiens. Wiens Family Cellars is located 7 miles East of the 15 on Rancho California Road. We know them as owners of Orange Coast Winery in Costa Mesa. Wiens is known for its quality bottles of red wine, like ‘Big Reds’. I was not disappointed. I think of all the wineries we visited the entire weekend I enjoyed this one best. We stood in a long line and bought our wine tasting tickets, paying $15 for 6 tastes. I think I tasted 9-10. Thank goodness for spitting. Considering the first impression of the groups Temecula trip, this stop was a jewel that softened our attitudes and convinced us our visit was worth the trouble. The next morning we circled for a quick pow-wow, deciding we needed to find smaller wineries off the beaten path. Aha, the less traveled road would lead us to discover small, hidden wineries where we could relax and enjoy the experience. Sunday turned out to be an excellent day! We began the morning with a stop at Doffo. Located on the Northeast border of Temecula valley and founded in 1997 by Marcelo Doffo. It is built around the former site of a Temecula historic landmark schoolhouse. Inside is a private collection of over 100 racing and vintage motorcycles. Their bottles of wine were not bad either. The Malbec, Syrah and Zinfandel 2011 were all winners. My sisters went gaga over the fresh chimichurri, buying several jars. The tasting room was very relaxing and the employees very attentive and helpful. They also have a selection of meats, cheese and crackers if you wish to munch while your taste. I would definitely go back. Our group at Wilson Creek Winery, awaiting our turn aboard a ‘golf cart bus’, seen in the background. 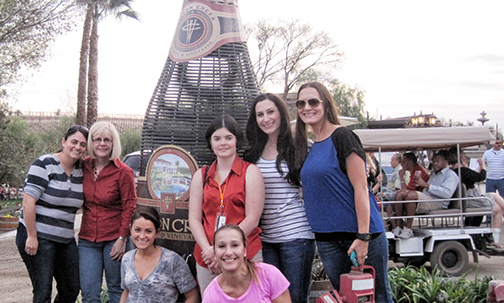 Armed with an employees’ recommendation, the group set off to have lunch at Falkner Winery. My nieces were looking for a Vegan/Gluten free restaurant. I thought good luck! Boy was I surprised. The Pinnacle Restaurant at Falkner Winery offers great panoramic views, outstanding Mediterranean style food and high quality service. Yes, Vegan and Gluten free are on the menu. Our large group of nine was seated within a short amount of time. The food was excellent and reasonably priced. This was a nice relaxing lunch. Yes, there wine was tasty also. The last place we tasted was a request by me. I wanted to revisit Wilson Creek Winery & Vineyards again after 12 years. I knew it would be crowded but I was ready to fight my way through the crowds. Wilson Creek is famous for their Almond Champagne, the only champagne I will drink. So off we went. The place had either tripled or quadrupled in size since my last visit. Parking our car way out in the North 40, we started our journey though the huge dusty parking lot to the winery. Suddenly a young man zipped up to us in a ‘bus’ golf cart. Hopping aboard he drove us to the wineries’ front door. There was a point of purchase station outside the winery to queue up and buy our tickets. The price to taste is $15 on weekdays, but $20 on weekends. All in all it turned out to be a great weekend. Temecula deserves more exploring. I plan to go there is the future but not on a big holiday weekend, nor a regular weekend, but during the midweek when it is quiet to relax and seek tastings of interesting California bottles of wine. Erin O’Neill-Hodge enjoys a good bottle of wine, visiting and enjoying California wineries from Lake County to Orange County, from the Paso Robles Gold Coast to Gold Country and from Lodi to Bakersfield with her husband, a writer & photographer. This entry was posted in Blend, Cabernet Sauvignon, California Wineries - New World Wines, Chardonnay, GSM, The Pleasures of Tasting Wine, Zinfandel and tagged bottle of wine, cabernet, california, chardonnay, Sauvignon, syrah, temecula, wine, wine tasting room, zinfandel.